Five year after the overthrow of first democratically elected President Mohammad Morsi on July 3, 2013, Egyptian President, Field Marshall Abd al-Fattah al-Sisi’s government continues to rule with worst human rights violations as police systematically used torture, arbitrary arrests, and enforced disappearances to silence political dissent. The crackdown on civil society escalated with NGO staff being subjected to additional interrogations, travel bans and asset freezes. Arbitrary arrests and detentions followed by grossly unfair trials of government critics, peaceful protesters, journalists and human rights defenders were routine, the Amnesty International said adding: Mass unfair trials continued before civilian and military courts, with dozens sentenced to death. Women continued to be subjected to sexual and gender-based violence and were discriminated against in law and practice. The authorities brought criminal charges for defamation of religion and “habitual debauchery” on the basis of people’s real or perceived sexual orientation. Egypt’s first democratically elected president Mohamed Morsi spends his fifth year behind bars since he was ousted by the military in a coup in 2013. He was tried in six cases; a mass jailbreak, murder, spying for Qatar, espionage with Palestinian group Hamas and Lebanese group Hezbollah, insulting the judiciary and terrorism. “Verdicts against Morsi are politically-motivated,” Alaa Abdulmunsif, head of Salam Organization for Protection of Human Rights, told Anadolu Agency. “The regime wants to get rid of him,” he said. In June 2016, an Egyptian court placed Morsi on the country’s official list of “terrorists” for three years. In the same year, the Court of Cassation, Egypt’s highest appellate court, upheld a 20-year jail term against Morsi on charges of murder during deadly clashes between supporters and opponents outside the Ittihadiya presidential palace in 2012. 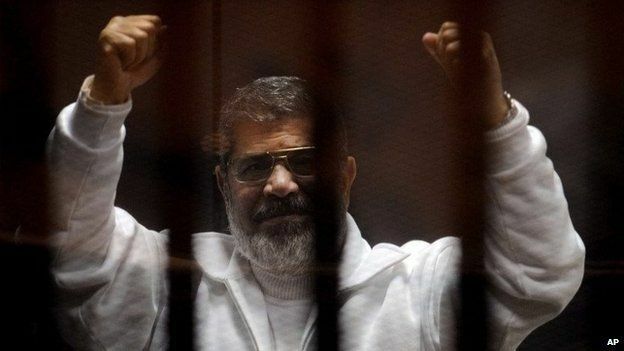 Morsi, along four other Brotherhood leaders, was also sentenced to death for alleged involvement in a mass jailbreak in 2011 during a popular uprising that swept former autocrat Hosni Mubarak from power. However, the Court of Cassation overturned the verdicts and ordered a retrial in 2016. Morsi was slapped with a life sentence for allegedly spying for Qatar. He was also sentenced to three years in prison for offending the judiciary. The former president is also standing a retrial on charges of a mass jailbreak and espionage with Hamas. Saeed Sadek, professor of political sociology at the American University in Cairo, was quoted by Anadolu Agency as saying that Morsi’s trials are the result of “political competition”. “How come those who overthrew him would set him free” he asked. Sadek ruled out any reconciliation between the Egyptian regime and the Muslim Brotherhood in the near future. “The regime now is very strong and will not look into reconciliation with the Muslim Brotherhood,” he said. Hundreds of anti-government people are on death row while thousands sentenced to long-term jail by Egypt’s Kangaroo Courts. On March 10, 2018, an Egyptian Kangaroo court sentenced 10 people to death and five others to life in prison for allegedly forming a “terrorist group” to plot attacks on security forces and other institutions. The authorities continued to curb the work of human rights defenders in an unprecedented manner as part of their relentless efforts to silence all critical voices, according to Amnesty Internatonal. In May 2017, US client President al-Sisi signed a draconian new law giving the authorities broad powers to deny NGOs registration, dissolve NGOs and dismiss their boards of administration. Between January and May 2017, courts sentenced at least 15 journalists to prison terms ranging from three months to five years on charges related solely to their writing, including defamation and the publication of what the authorities deemed “false information”. Security forces arrested at least 240 political activists and protesters between April and September 2017 on charges relating to online posts the authorities considered “insulting” to the President or for participating in unauthorized protests. The authorities used prolonged pre-trial detention, often for periods of more than two years, as means to punish dissidents. Forces of the Ministry of the Interior continued to subject to enforced disappearance and extra-judicially execute people suspected of engaging in political violence. According to the Egyptian Commission for Rights and Freedoms, security forces subjected at least 165 people to enforced disappearance between January and August 2017 for periods ranging from seven to 30 days. Egyptian police and National Security forces have carried out a wave of arrests of critics of President Abdel Fattah al-Sisi in dawn raids since early May 2018, Human Rights Watch said. The charges against them appear to be solely based on their social media posts and peaceful activism. Security briefly held several of the detainees incommunicado.